Göteborg, Sweden, 2017 . 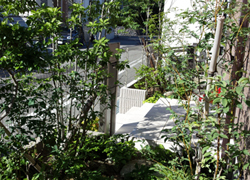 Courtyard garden (tsuboniwa), visible from all the rooms and corridors. Landscapes from rapid, river and down to the sea were suggested in the form of karesansui. Pinus parviflora is a strong accent to the garden. Ohyodo, Nara, 2017 . 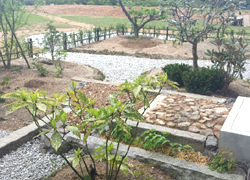 New residential garden. Big river rocks were used to recall predominant landscapes features of this region: Katsuragi-Kongo mountains and Yoshino river. Göteborg, Sweden, 2016. Karesansui installation inside the main hall of the dance theater called 3:eVaningen. 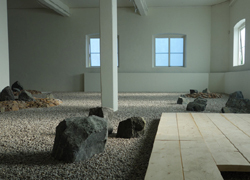 Dance and music performances were held during the six-month Japan festa, using this stone garden both as meeting space and stage set. Kobe, 2016. 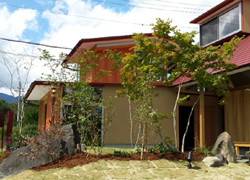 Front garden of a new redidence, divided in two by the centeral entrance porch. 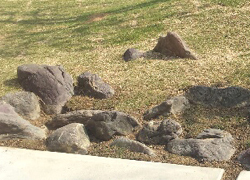 Right side is characterized by soft soil-retaining stone composition whereas left side by path-way of tobiishi. Kashihara, Nara, 2016. 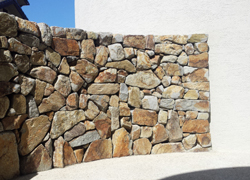 Curvilinear Stone wall to enclose the ground-floor terrace of a new residence. The andesite stones come from the nearby Nijo mountains. Sakurai city, Nara, 2015. Garden for a new residence. The path, leading to the wood-deck, is paved with boulders. 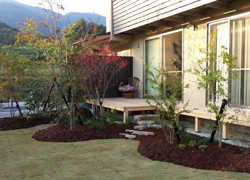 Large area of lawn spreads on the carefully shaped landform. From out of the window of the Japanese-style room is a weeping cherry. The karesansui was made from the collection of river stones the client owned as memento of father. Insipiration was drawn from the riverine landscape of his home village. Gojo city, Nara, 2015. Garden outside the Japanese-style room, also functioning as passage to the vegetable garden outside. 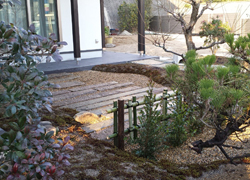 Composed of nobeishi edges, steps paved with "found" stones, planting beds and low bamboo fence. Gojo city, Nara, 2014. The gentle curves composed of the lawn and the plant islands are drawn from an image of inlet landscape. Main plants: Acer palmatum, Enkianthus perulatus, Vaccinium oldhamii, Cornus kousa, Euonymus alatus. Kashiba city, Nara, 2013. 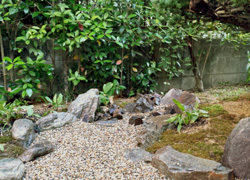 Residential garden composed of karesansui, stone-paved path, terrace paved with nobedan and essential volume of plants. The traditional auspicious trio celebrates the space: Pine, Bamboo (fence) and Prune. Collaboration with Sakamoto Zoen Doboku, Yoshino. Kashihara city, Nara, 2013. Rectangular, south-facing garden of a private residence, inspired by a series of landscape pictures dipicted across a picture scroll. Otsu city, Shiga, 2014. 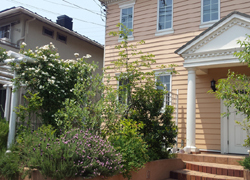 Front garden of a residence built in Neo-classical style. 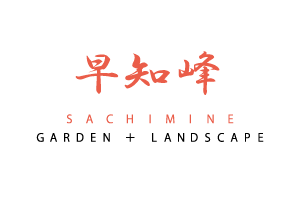 The client request was a small orchard garden to enjoy flowers and fruits. 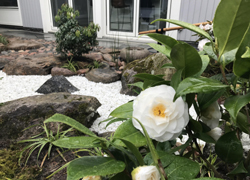 The plants used were: Feijoa, Amelanchier canadensis, Arbutus unedo, Blue Berry, Myrtus communis, Lemon, Zanthoxylum piperitum, Weeping Roses over the pergola, Plumbago on the trellis. An almond tree stands as a sign of welcome and welcome-back. Inspiration comes from Japanese Tea Garden and karesansui. On the horizon beyond the olive orchard is the cupola of the St. Peters.